I woke up this morning bleary-eyed and entirely unrested. Between the cat singing a soulful aria in the middle of the night and the bedroom going from too hot to too cold, I’d gotten almost no sleep. It was, in other words, a crashed morning, which led predictably to too much coffee and a crashed day. 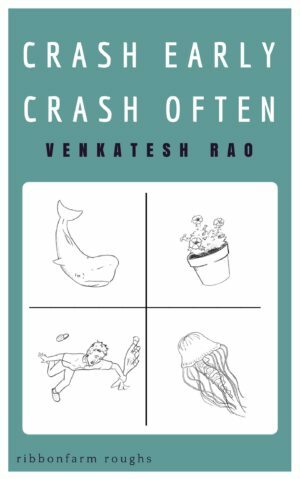 A terrible kind of day for most things, but a very appropriate one for launching the third ebook in the Ribbonfarm Roughs series: Crash Early, Crash Often, now available on your Friendly Neighborhood Kindle for $4.99. In this fine collection of essays, the third volume in the Ribbonfarm Roughs series, Venkatesh Rao (author of Tempo, The Gervais Principle, and Be Slightly Evil) ponders midlife crises, immortality, graceful aging, learning, personal growth, community, individualism, and the Big Question of how to live a life full of meaning, dignity and significance. Drawing on the lessons of his own life and the philosophies of Douglas Adams and James Carse among others, he attempts to construct a playbook for a life full of enriching experiences, satisfying accomplishments, and deep relationships. After a dozen long, meandering essays, he entirely fails to get to anywhere even remotely useful, and crashes gracelessly to the edge of the void, where he discovers the void giving him the stink eye. Originally published on ribbonfarm.com between 2014, when Rao turned 40, and 2016, when he turned 42 (a significant threshold in his religion), having learned nothing in the interim, these essays provide a poignant and vivid illustration of the art of entering middle age with all your indignity, incomprehension, and cluelessness intact. Here are the posts in the ebook, linked, and in the sequence they appear, for those of you too cheap to shell out $2.99 for the pleasure of reading them on your Kindle, or living in places that haven’t been Amazoned yet. 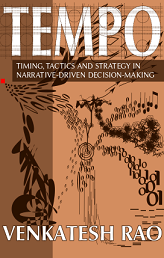 Crash Early, Crash Often (CECO) marks, we hope, the beginning of a more regular and predictable schedule of compiling themed collections of ribbonfarm posts into ebooks. With CECO, our ebook publishing operations enter a brave new era under the stewardship of former resident Jordan Peacock as ebooks editor, who put this collection together and wrote a courageous and foolhardy preface trying to make sense of whatever the hell CECO is all about (I myself gave up somewhere in the middle of 2015). Four more ebooks, based on the Rust Age collections, are in the pipeline and will be available in August. They will join the already published first two Ribbonfarm Roughs volumes, The Gervais Principle (GP) and Be Slightly Evil (BSE) to round out a nice six-volume collection covering 2007-2012. After we get through the Rust Age backlog, we’ll begin trawling the 2013-2017 archives to compile more collections from the Snowflake Age. For long-time readers we hope these ebooks will offer an opportunity to re-read old posts (including any you may have missed) with the benefit of hindsight, and the context of broader themes that have emerged over the years. For new readers, we hope these ebooks will offer an easier entry point into the Ribbonfarm Blogamatic Universe, which now has so many superheroes, supervillains, and confused plotlines, we are almost certain to encounter a Crisis of Infinite Ribbonfarms by 2020. Believe it or not, we don’t actually set out to create such a royal mess. Unlike many insular subcultures marked by moats of carefully curated in-group language, inside jokes, and various protective hexes and curses, we don’t actually mean to be inaccessible or incomprehensible to n00bs around here. That’s just the unintended consequence of living the CECO philosophy. The messy confusion you see here is completely authentic, organic, and free-range. It is not something created to confuse you. So grab a copy of Crash Early, Crash Often and come on in to join the refactoring. And watch your step as you enter. Super-mega-arch thanks, for giving the list to read them for free. The “confusion” is, basically, to have an important Ne (in Jungian typology terms) and to be aware of more about one’s self than everybody else seems to be. Everybody has “the confusion”, like a sea underpinning the terrain their ego walks on, quietly and without worry. Well.. it’s like the deep strata of Earth and its surface. People don’t even imagine what lies beneath their masks (their inner masks, even). This is “mental health.” To live under the light of appearance, without catching sight of the shadows within. And then there is another mental health 2.0, to be reached after having explored all the charted, and all the uncharted, and rescued one’s Self. All those legends… with the hero rescuing the beauty from an evil force… the beauty emblemizes one’s soul. “These choices can also lead to odd patterns of identification with, and attachment to, dead or unborn cultures and people. It can lead to a sense of connection to larger human realities that is not purely genealogical. They can lead to social identities that make no sense to anyone, but are not exactly individualist either. They can make the contemporary living around you resentful and angry about your withdrawn, ghostly lifestyle. Yes. Beneath the ego is the personal unconscious. Beneath that is the collective unconscious. This is a highly shared area of the brain, which of course is scantly accessed by our ego. Too bad you overlooked to specify why the contemporaries get resentful and angry”: let’s just say that even envy divides into conscious envy and unconscious envy, and there is nothing that wakes envy like mental freedom (probably because nothing else is owned by as few). But from Zen philosophers to quantum mechanics students, many are questioning the “reality” of time. I read a philosophers who says that every single instant might be eternal. All what appears to us, ourselves included, is eternal. After all, when an instant later you say “X is no more” you see something else replacing X, you never really see X disappear. X was, an instant before, and still is, although it is now out of the sphere of what appears to your eyes. (And, by the way, the very fact you can still remember it means it still is. How else could you talk of it?